If you bottle your own beer, keeping it cold is as easy as clearing a shelf or two in the fridge. But if you prefer kegging your homebrew and serving it straight from the tap, you’ll need something a little more robust to keep your brew frosty and fresh. You’ve got a couple of options for doing so: a kegerator or a keezer. As their names imply, a kegerator combines a keg with a refrigerator, while a keezer combines a keg with a freezer. Your beer stays cold and can be enjoyed in a mug or glass or dispensed into a container at the push of a lever. That’s where your beer tap or faucet will come in. 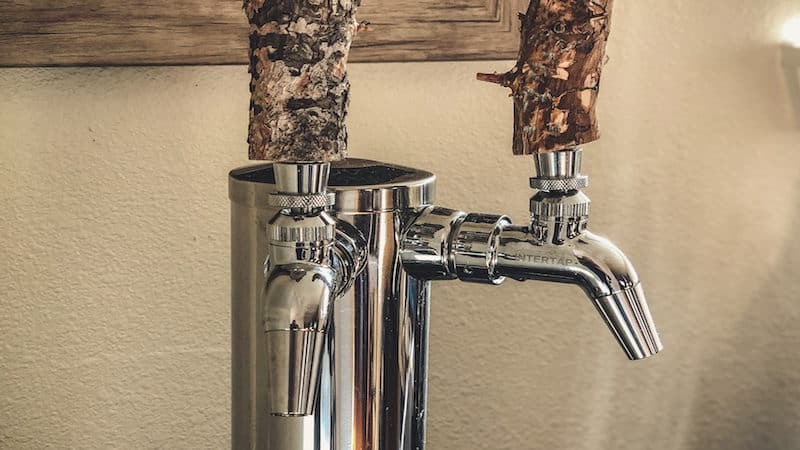 While you might consider the terms beer tap and beer faucet to be interchangeable, the latter is actually distinct from the beer tap, also known as a shank. The beer tap connects the line to the keg, and the faucet acts as a valve to dispense beer on demand. 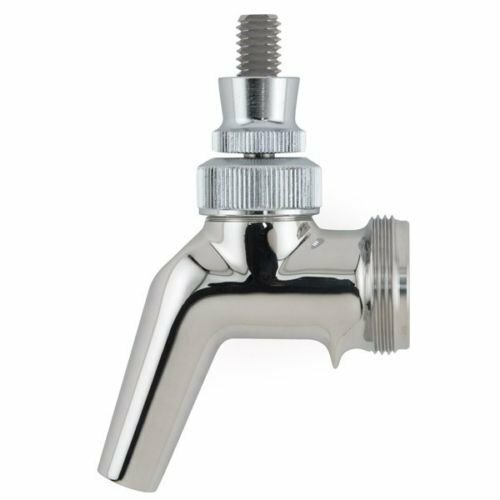 Although many homebrewers do refer to the combined tap and faucet as “the beer tap,” it’s important to be aware of this distinction when ordering, replacing, or discussing parts. These mechanisms give you control over how much you’re serving, and into what kind of container. They can be modified, for example, to dispense into growlers, or modified with a nitrogen draft tap to dispense your favorite stouts, thick porters, and other creamy brews. If you’re a frequent homebrewer, you’re going to be dispensing a lot of beer, so your equipment needs to be in top working order and squeaky clean to ensure that you get your beer into your glass or mug with ease, and enjoy a fresh-tasting brew with every serving. So what makes for a good beer tap? We’re glad you asked! 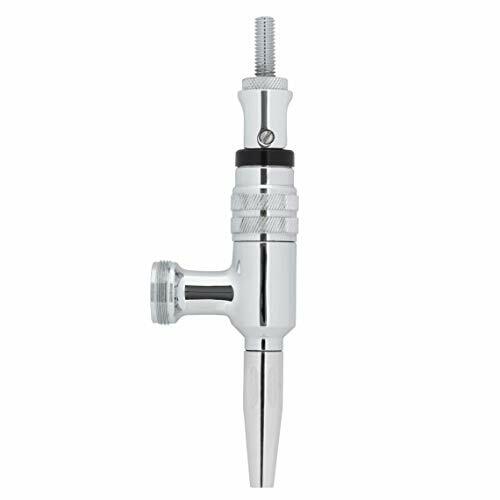 While dispensing equipment including shafts, levers, and the tap handle can be made of many materials, from basic plastic to high-end metals, chrome-plated brass and stainless steel are the most popular choices. Brass fixtures are more affordable, while stainless steel offers greater durability. While stainless steel fixtures are initially more expensive, they can save you money in the long run as they’re immune to corrosion. Nickel chrome and brass are both susceptible to breaking down over time due to exposure to cleaning products or even the relatively low acidity of many beers. When this corrosion occurs, the parts can begin to add funky, unpleasant flavors and aromas—known in less polite circles as shank stank—to your beer. An easy-to-clean beer tap will make your life a lot easier. Regular cleaning is essential to high-quality beer enjoyment because without it, beer residue can accumulate and encourage the growth of mold. Not exactly something you want floating around in your pint, right? In addition, that accumulation can also cause the mechanism to get sticky and malfunction, wasting your precious beer and all that hard work you put into brewing it. Finally, unless you have stainless steel components, beer residue can actually corrode your equipment. This is a big reason we advocate the use of stainless steel parts for a lot of homebrewing equipment. Clean up any spilled beer as soon as you see it, and keep your beer tap clean and dry with a quick wipe after every few pours, or as needed. Also clean your kegerator or keezer inside and out on a regular basis to help discourage bacteria, mold, and mildew that can compromise your entire system, not to mention your health. 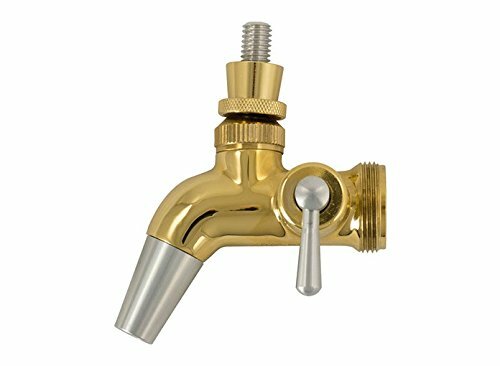 So now that you know a little more about the best materials and how to take care of a beer tap faucet, how do you choose the right one for your setup? You’ll find three common types available to you: standard (or North American), European, and Nitro Stout. 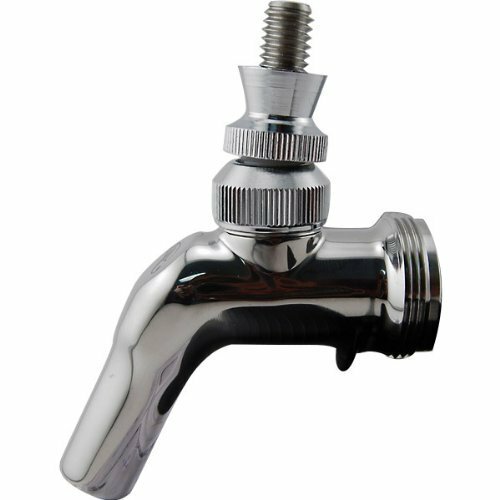 Rear-sealing, designed to be compatible with multiple systems, and easy to swap out are the primary features of the standard beer tap faucet. 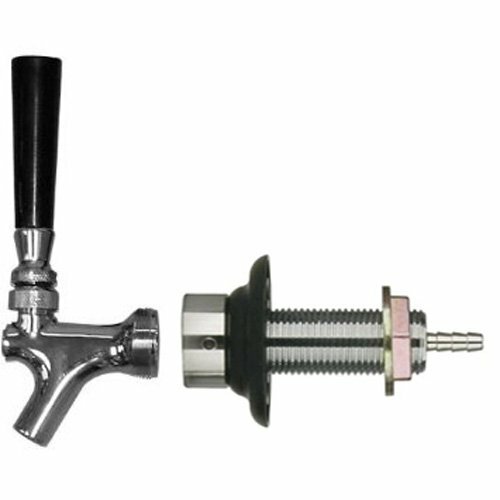 Sized at ⅜” for the lever and 1 ⅛” for the faucet, the standard works well with standard beer taps as well as kegging towers, the attachments that conceal the tap lines for your kegerator or keezer and allow for easy dispensing. They most often come in brass and steel, and can be modded to accommodate attachments designed to fit their standardized sizing. Options include self-closing models, which automatically close the tap when you release the handle, and flow-control models, which give you a manual valve for precise control over pour speed and flow. European beers often require a slower pour to produce less foam. This is accomplished with the longer spigot of the European beer tap, which also makes it easier to fill growlers, doing away with the extra cost of a special growler attachment. A European beer taps are often sized differently from their North American counterparts, so if you opt for this model and you live outside Europe, you’ll likely need to shop for custom accessories to match. Stouts, porters, and the like are brewed to incorporate nitrogen-rich air and are designed to be enjoyed warmer and thicker than their lighter, highly carbonated brethren. Also known as nitro draft beer taps or simply nitro taps, these models are used to control the pour of old-world beers. This is often referred to as the nitrogen effect. 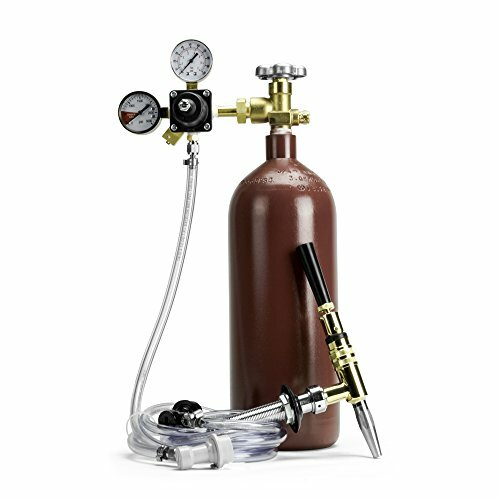 While you probably want to avoid the expense and risk of a high-pressure nitrogen gas mix system, this model can help you accomplish the nitrogen effect with some specialized hardware that works either by simply modifying the pour for a creamier head or by incorporating a nitrogen tank system with existing CO2-based kegerator or keezer systems to serve beer “on nitrogen,” which is generally a 70% nitrogen/30% carbon blend. The faucets themselves use a small disc, perforated with a few tiny, strategically placed holes, to “knock out” carbon dioxide and produce the long, slow pour, distinctive head, and creamy mouthfeel associated with heavier beer styles such as stouts. They can be configured as a dedicated beer tap, or as a mod to a standard one. If you’re on a budget or new to kegging and want to experiment without a major investment, these low-cost beer taps are your best bets. The best of both worlds if you’re building your first system, or looking to add a new beer tap to your existing one. This standard beer tap set includes a handle for one-stop shopping convenience. The handle is replaceable if you’re looking to improve the look or durability, and the chrome-plated brass should serve most users without incident provided it’s kept clean. Known for their high quality and durability, Perlick fixtures are generally considered to be among the best in the world for homebrewers and professionals alike. This basic model isn’t showy, but does boast the standard array of Perlick improvements. Proprietary design reduces beer agitation and eliminates exposure to air, while forward-seated design prevents pooling beer. We love this faucet for several reasons, not the least of which is the fact that it never gets sticky, thanks to its easy-to-clean design that stores beer in the actual faucet. Plus, it’s compatible with all standard beer taps. Finally, you can modify it to incorporate a range of spout accessories, including growler fillers and stout taps, and save yourself the bother and expense of buying a whole new setup for each. The ability to serve up rich porters and tasty stouts with a slow pour, inviting aroma, and creamy finish is why we love these nitro beer taps. 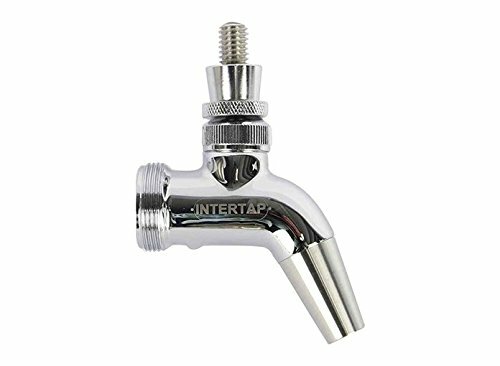 This handy accessory screws into any existing Intertap faucet to provide a perfect pour for nitrogenized beers. More of a mod than a full beer tap, it’s the perfect addition if you’re considering an Intertap for your kegerator or keezer, and gives you greater versatility and convenience than a separate dedicated beer tap. 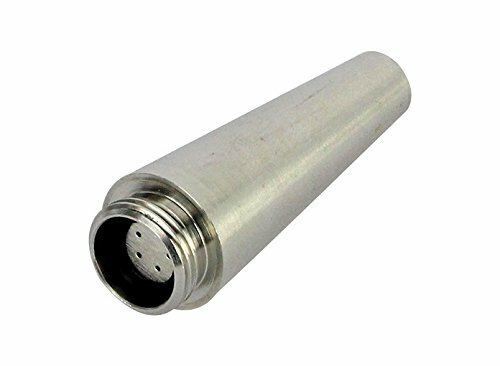 A good basic nitro draft nozzle choice for those looking to test the nitrogen-rich waters (or suds) of nitro brews. The body is made of chrome-plated brass, while the nozzle is stainless steel to protect flavor and prevent corrosion. If you have a ball-lock keg setup, adding nitrogen to your homebrew setup is just a click away with this mod kit that incorporates nitrogen blend gas into beer as it’s dispensed. It includes the tank, the brass faucet, and all the fixin’s, but you’re on your own for the keg, the gas, and—naturally—the beer! If you’re looking for high-quality materials and special features, these beer tap faucets are the cream of the crop. Boasting a longer spout and a handy push-lever creaming function, this model lets you serve your beer with the perfect amount of thick, creamy head by pushing, rather than pulling, on the tap handle. It’s also got an array of improvements and stainless steel construction to ensure many years of hassle-free performance. Combining versatility and quality with an extra-special gilded glow, this stainless steel, gold-plated faucet is as hardworking as it is beautiful. Perfect for anyone who enjoys an upscale basement brewpub or a custom-built kegerator fit for a king (or queen!). 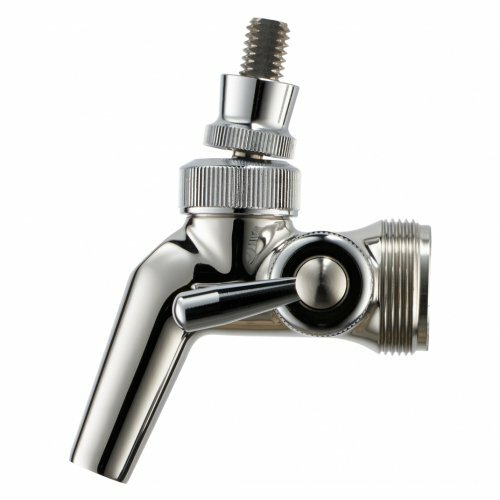 Fine-tune your flow with this stainless steel gem, which has a built-in flow-control valve to allow for perfect pours. No more wasted beer or crazy foam-overs! Whether you choose a keezer or a kegerator, the components you choose for serving are as important as the ingredients and equipment you choose for brewing. Your beer tap and faucet are absolutely two of the most important components, because they’re the last things your beer touches before it hits the glass. Making sure they’re easy to install, use, clean, and maintain is essential to long-term homebrewing happiness. As with so many other aspects of homebrewing, the “right” beer tap or faucet depends on your brew, your budget, and your build. There’s no “wrong” choice, provided you install it properly and keep it clean, of course! Just remember that the homebrewing adventure is about the journey, and not always the destination. You can start out with a basic and dependable beer tap, then upgrade to a more upscale model with greater versatility as your interests and skills grow, or add to your collection as you experiment and diversify. What matters most is enjoying the fruits of your labor with friends and family.